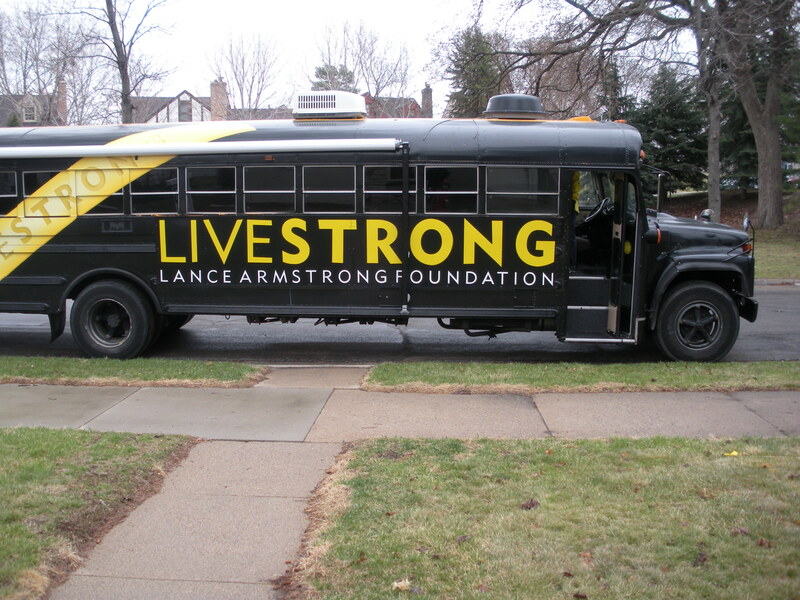 You might be asking yourself, why a picture of Lance Armstrong’s bus on the day of the Get Your Rear in gear 5k? Answer: This was the Team “Car” for the 70 members of Team Baty Sisu. Team Captain Sarah out did herself on this one. Long story short, friends of friends of friends of Lance Armstrong let us borrow one of his buses for this event. The price on my face must have been priceless when I turned the corner and saw my “team car” waiting for me outside Sarah’s at 6:50 a.m. I am guessing the 100 other teams, race organizers and general gawkers must also have had the same look when we pulled into the parking lot of the event. Sarah did an amazing job of pulling this all together! We had many of the 4,000 participants stopping by our bus thinking it was a vendor of the event. Lucky enough Sarah had even thought aoubt them when putting his together-she purchased 200 Live Strong bracelets to hand out to other people. I promise I will get more pictures of the event posted soon. A special thanks goes out to Paul who not only had the connections to get this bus but also had a license to drive it. Also a special thanks goes out to everyone who was part of our team and showed up at 7 a.m. in 34 degree rainy weather to take part. Our team was one of the bigger one’s there. We had Jon and Cindy Ness and Amber Gooch who made it all the way down from Bemidji to participate. And to show off her strong Bemidji upbringing, Cindy wore shorts while everyone else was bundled up in 2-3 layers. We also had the Berger’s drive over from Plum City, WI and Dianne’s ex-coworkers drove up from Rochester to surprise her. We had a big Pictura contingent along with a big group of Sarah’s friends and Co-Workers. We had a few of Dave’s friends from Bethel along with several of my close friends and their families. 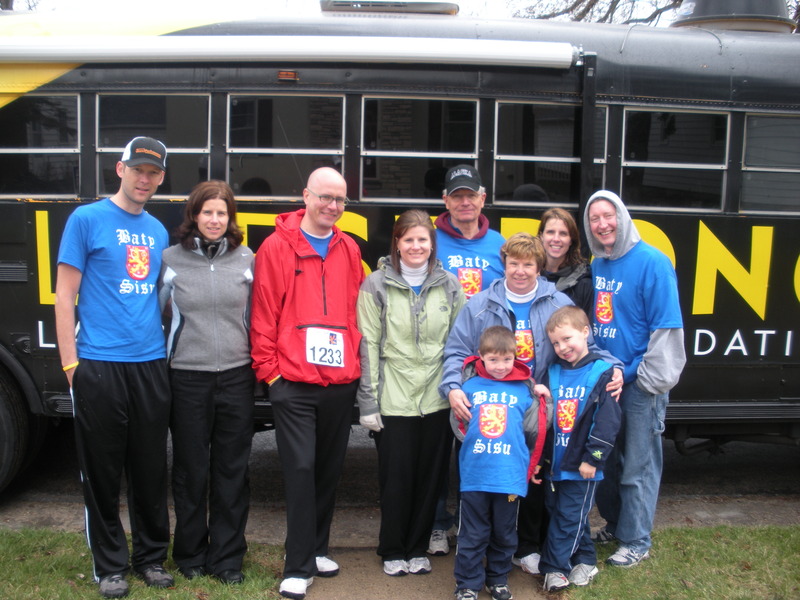 We had ex-Proex people, Mike and Todd, who ran a great race, along with Shelly G. and her family. Of course we had all of my family and Karen’s family take part including all the kids. My nephew Caden and niece Caylee both ran great races in the kids race. Nathan, our ringer, ran a great race placing 3rd in his age group. I did the 5k walk in 1 hour and 15 minutes-not too bad. It was great to see everyone and I am so thankful for everyone who took part and wished me well. It was truly one of those magical days/moments in life, albeit a cold one. I promise I will get more pictures up of the bus and of our team area soon. In the rush to get there we of course forgot out camera, so I will have to get photos from everyone else. If you are a Facebook fan, I see team Captain Sarah Stratton has already posted a picture of Brenden and I on her page. I will try to post something as soon as I can about my scan results tomorrow. My scan is at 11 a.m., I am guessing/hoping I will get results around 3-4 p.m. I will post something as soon as I can afterwards. It was a pleasure and honor to participate with your “team” and cheer you on! Even though we would like to take credit for providing you with support, we all know that the glory belongs to God and he is the one that brought us all together for you today…..I do believe you have his full attention 🙂 Your faith will get you a lot further than any of us ever will, but I think you already know that. 5K what a day, I’m all wet, but then; everyone that knows me have known that for a long time. It was great to see and walk with you. Your always in my prayers. Chris, had a great time and was nice to see you again. On the way home, we talked about the excitement of the crowd and the special feeling that came with that walk. It was our pleasure to walk with your family and friends and you are truly blessed. You are in our prayers at home and at church. What an accomplishment…the race, support, and faith..you are an inspiration to ME! It was cold and rainy but such a great thing to be a part of! Can’t wait to do it next year with ya!